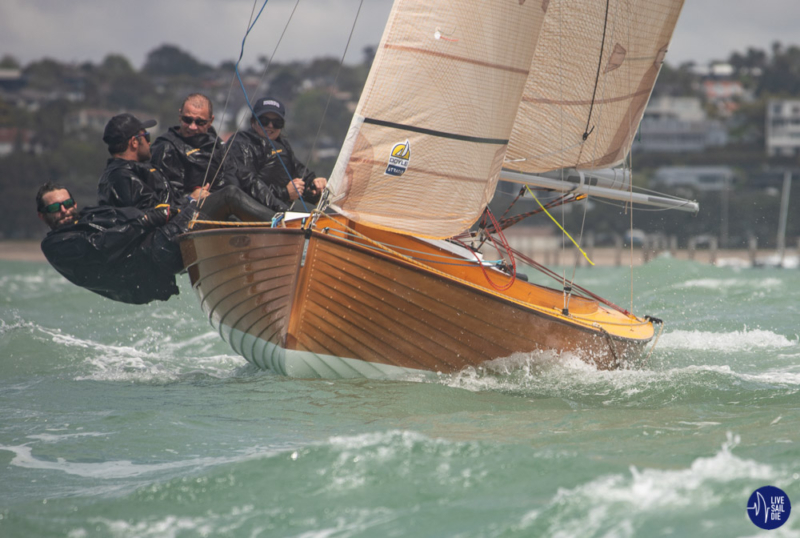 M47 Matara has taken the lead in the Royal Akarana Yacht Club Akarana Series M-Class division after two intense races on Auckland’s Waitemata Harbour with the conditions described as “liquid Himalayas”. Four of the six boats made it to the start line in conditions that deteriorated as the day went on. 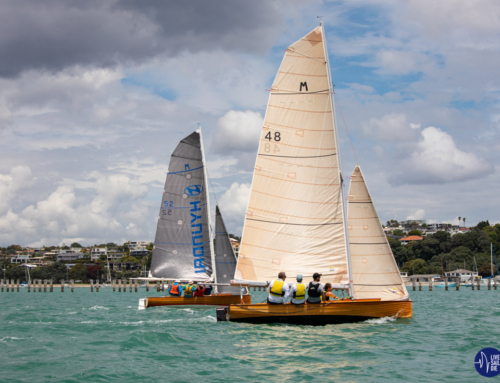 Two harbour courses were dealt to the fleet, taking the boats from Orakei to North Head, Bean Rock, Orakei, North Head and finishing back at Orakei. The forecast 10 knots with flat water sailing, which was sold to the new sailors who stepped on board the classic kauri clinkers, proved a little inaccurate and competitors were instead confronted with a 25-27 knot northerly and an outgoing tide. This was a complete fabrication of the brochure presented earlier in the week. Matara opted for the pin end start and was quick off the line beating into the wind and waves as they crashed over the bow. It was neck and neck between Matara and Menace up the first work to North Head, with Matara rounding ahead. 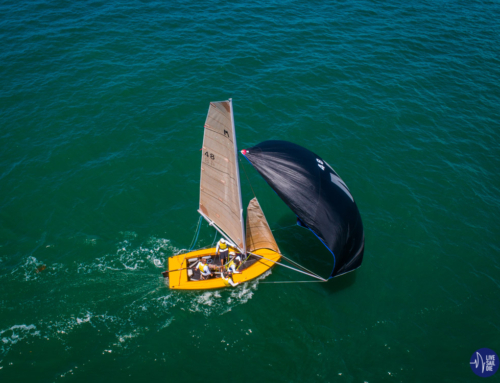 Matara opted to two sail reach into the Bean Rock mark, while Menace tried for the kite, however quickly lowered it due to the crazy conditions on the tight reach. All boats rounded the Bean Rock mark in a relatively clean manner however Matara suffered a set back, breaking a vital component of the runners. A repair job was in order and while this was underway, Menace re-hoisted the big bag and were screaming towards Matara at a rate of knots. However Matara managed to keep the upper hand, rounding just ahead of the Menace team. It was a challenging upwind with Matara having to fight extra hard to keep a clean distance ahead. Eventually it was Matara who screamed across the finish line ahead after a hectic race that resulted not only in the loss of the runner, but a crew hat and a broken finger nail. The other fleets racing as part of the RAYC Akarana Series, the 18′ Skiffs and 12′ Skiffs, opted to can their day due to the worsening conditions and they headed back to the safety of the ramp after just one race. However the mighty M-Class fleet gathered themselves together, made hasty repairs to the damage inflicted during race one, and cracked open their adult beverages when the five minute gun was fired, as per the unofficial M-Class rules. The same course was set, and while the bodies were still recovering from Race 1, the start gun was fired, signalling another battering for the ailing sailors. This time it was Menace and Mach One that got off the line ahead, with Matara and Marksman hot on their heels. Even with a broken runner, Matara somehow managed to wave a magic wand and claimed the upper hand halfway up the first beat. At the top mark, the decision was once again made to two sail reach and ride the liquid Himalayas into the Bean Rock mark. 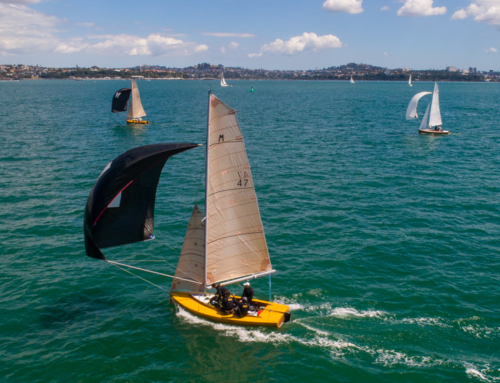 After a clean gybe, they set the kite without the pole and had an epic run into the bottom mark at Orakei. However Menace was again hot on their heels and after the mark, Matara began the covering process to keep Menace at bay. Coming into the top mark at North Head for the final time, Matara had a comfortable lead, which resulted in tactician Chris “Steely” Steele instructing the team, and especially the skipper Suellen Davies, to “Control the Peak” and began to pass around a number of cleansing ales to help settle the nerves on board. Steely looked over his shoulder to see Menace, Mach One and Marksman within sledging distance, so the call was made to pop the big bag and smoke it into the finish line. Just as Matara crossed the line, the crew looked back and saw Mach One skid into second place as Menace went for a near perfect capsize after a little out of control action on board. The swim was blamed on the small pole issues and the skipper constantly getting caught up in the abundance of ropes on board your typically over-crowed M-Class. Thankfully there was no loss of beverages on board, and after a few stressful moments, the crew were back sailing an upright bathtub. Thomas Saunders, who is currently campaigning the Laser for the 2020 Olympic Games in Tokyo, was taken aback after his day of helming Mach One.